The Devil’s Tale’s birthday (today!) happens to coincide with National Dessert Month. In honor of these two very important occasions, we’re going to be publishing dessert recipes from our collections every Friday this month. We’ll begin today, of course, with a birthday cake recipe from Gold Medal Flour’s 1931 New Party Cakes for All Occasions, part of the fine Nicole Di Bona Peterson Collection of Advertising Cookbooks. It might be slightly more . . . normal than some of the recipes we’ve previously posted (frozen cheese, anyone? ), but it sure is pretty. Cream the shortening and add the sugar gradually. Sift the flour once before measuring. Mix and sift the flour, salt, and baking powder, and add alternately with the milk. Add the flavoring—vanilla and almond together are good. Fold in the stiffly beaten egg whites. Pour into well greased and floured pans and bake. Cool and frost with pink and white icing. NOTE: Part of icing may be colored pink with vegetable coloring matter and used on sides of cake with white icing on top and between layers. 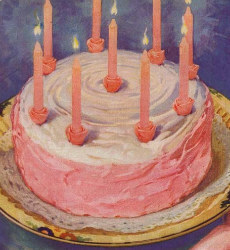 Pink candles to match sides can be placed on top of cake for birthday party. Special thanks to Lynn Eaton, Hartman Center Reference Archivist, for helping us find this recipe. That does look pretty, and quite edible! Mmmm, cake. I think at the end of October we should have a party with all the recipes you post (including frozen cheese). Wouldn't that be fun?? I'll make one, even the cheese.